Up to 4,000 away fans are at one end of the ground in the Chadwick Lawrence (South) Stand, with good facilities and views of the pitch. There’s a bookies and a bar serving alcohol including John Smiths, Fosters, Bulmers, Bulmers Red and wine. Huddersfield fans are a great bunch, and there should be no problem mixing with them. 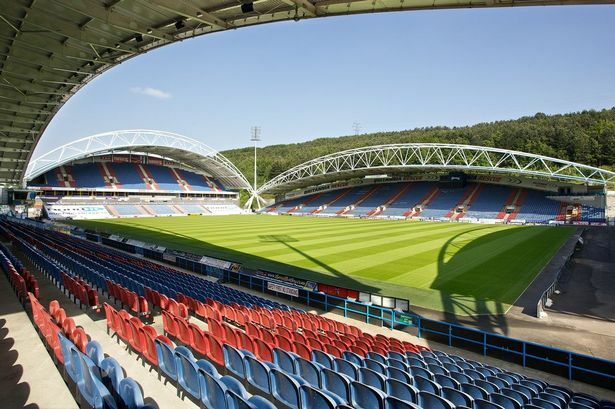 The market town of Huddersfield in west Yorkshire is well known for its role in the Industrial Revolution but for sports fans, it is probably best known as the the birthplace of rugby league. If you’re planning on making an overnight stay of it, then Huddersfield has a Premier Inn, Travelodge and a number of independent hotels. Nearby Halifax has a few things going on during the weekend of the game. The Victoria Theatre (HX1 1BP) hosts Smokie on the Friday night, tickets are from £28.50. ABBA Reunion are there on the night of the game, tickets are from £22.75. Square Chapel Arts Centre (HX1 1QG), on the Sunday has the folk band Stick in the Wheel, tickets are £12. At the stadium an entertainment complex has Rope Walk (HD1 6PG) a Flaming Grill pub. Home and away fans mix well. There’s a big, very reasonably priced menu football in shown on TVs around the pub. The Gas Club (HD1 6NA) has food, cheap beer and football on TV screens. The car park costs £6. Entry is £2 – it’s easy to find as its next to the large gas holder. After the game its home fans only. The Yorkshire Rose (HD1 6NW) will be open again after refurbishment. It’s a ‘Two for One’ chain with a large menu. It’s not big and fills up quickly on match days, so get there early. Near the train station is The Head of Steam (HD1 1JB). The King’s Head (HD1 1JF) is in the train station and has many real ales and ciders on tap. Not far away is The Corner (HD1 2QA), a tap room that is popular with real ale fans. Sometimes it’s difficult to get into some pubs, as many are home fans only; this included ‘The Cherry Tree (HD1 1BA) a Wetherspoons in the town centre. The ground is a 20-minute walk from the town; you could try ‘The Peacock’ (HD2 1XL). There’s a big car park at the ground (£6) and other car parks near the ground for around £5. The stadium can be walked to from the station in around 15 minutes. Train leave Swansea at 06:29, 07:29, 07:44, and 07:59 for the 5 hour trip. Trains leave Huddersfield at 17:11, 17:30 and 18:11, getting into Swansea at 22:55, 23:55 and 00:27.